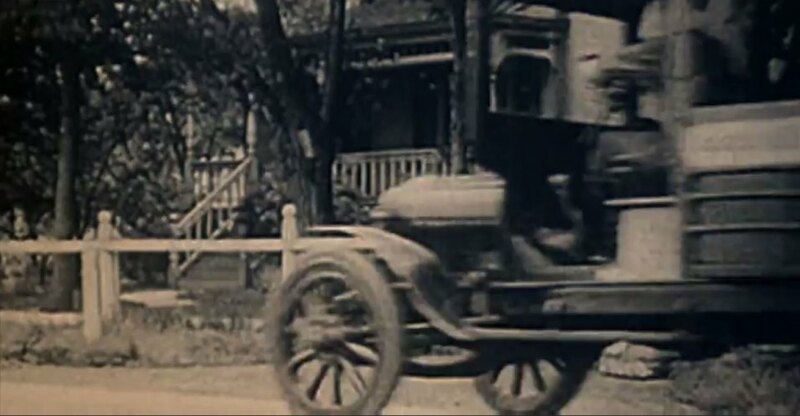 IMCDb.org: 1917 USA Liberty US Mail in "James May's Cars of the People, 2014-2016"
James is talking about Ford trucks at this point, but these snippets of archive film may be more random than suggested. Hard to tell what this is but I see it has electric lights. 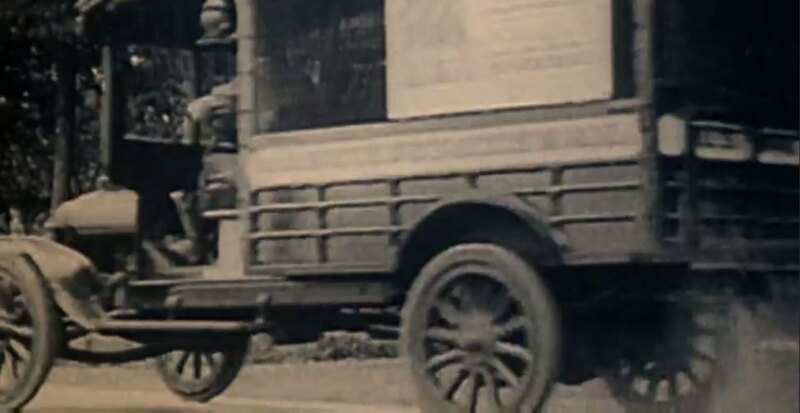 It could be one of the thousands of WW1 military trucks that were reconditioned and resold after the war, a move which severely affected the British truck industry. 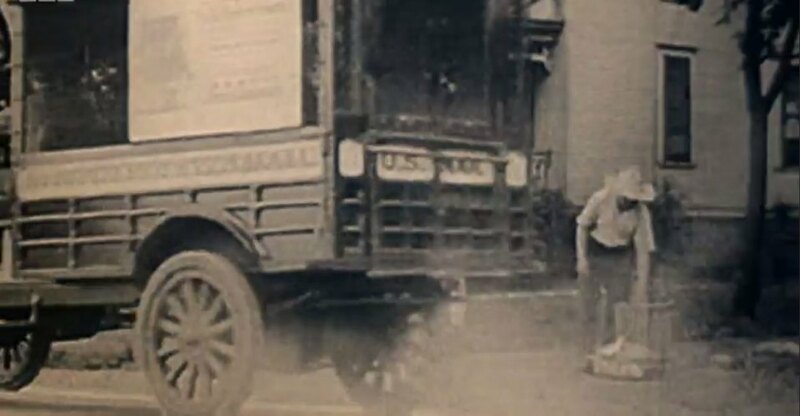 These are a US Mail truck, I'm guessing a Ford. A Ford with longitudinal front springs? That is a transverse spring. I'm going on the assumption that there are two different trucks on this page. If the main pic is also a mail truck, it might be from whatever made this. Maybe an Autocar. I think they are 2 different trucks - main looks like smaller wheels with solid tyres/rims, and seems to have bonnet ahead of cab not a flat front - if so side edges would probably be right-angle corners to match radiator profile. Difficult to tell, but it seems to be coming to a stop alongside platform which might have a small buffer extending outwards. Second truck is also coming to a stop, but it's not the same place. Also I think it has air-filled rubber tyres on bigger wheels and the bonnet is too rounded to match the radiator in main. Something like the Link to "www.conceptcarz.com" link looked pretty good to me until jfs pointed out the suspension, but the overall shape looks comparable. However main is more ramshackle - possibly less integrated or more awkward body style - and may be older?? But these are all impressions in a very quick bit of footage, not solid fact. I don't really see any suspension in those three images, just the axle. The US Mail did have a strong association with both Ford and Autocar way back when. Quote In 1920 the Secretary of War turned 5,000 motor trucks and 1,000 motorcycles over to the Post Office Department. 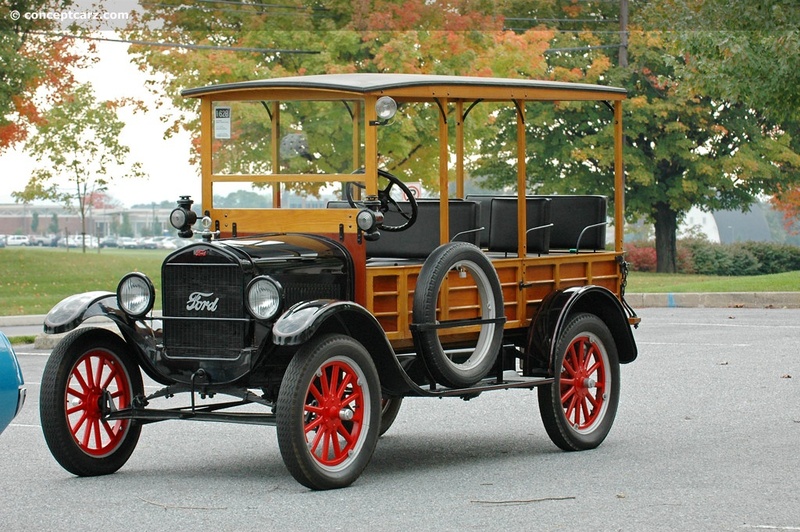 The vehicles, used during World War I, were a mix of makes and models. Many were too big or too beaten up for mail service. 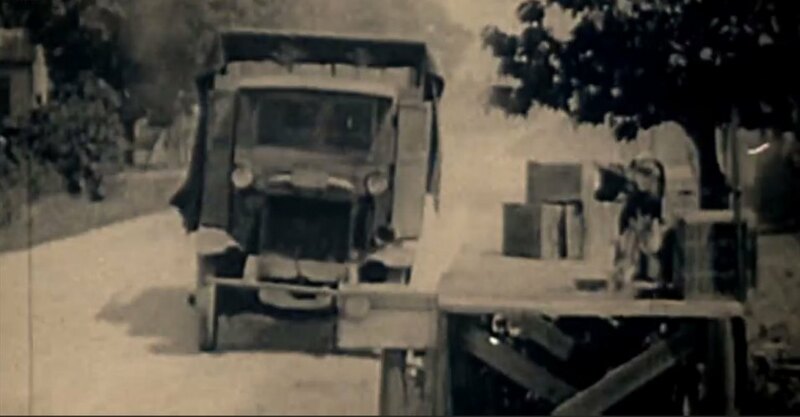 In the end, only 1,444 of the trucks and 701 of the motorcycles received from the military were used to carry the mail. Could the main pic be a Liberty truck? I'd take it as a Liberty - seems to match what I think I can see. Anyone else?? Which probably means spinning truck 2 off onto its own page - can we get agreement for an ID?? Ford?? Or?? Liberty is as good a guess as any other. The second image does not look like a Ford, there is no sign of axle location rods or of the Ford transmission, which protrudes below the chassis, and it looks too big. It also has semi elliptic rear suspension with a longitudinal spring on either side of the axle, which isn't the standard for a T or TT. The engine cover seems to have an ogee shape reminiscent of a Packard from the teens of the 20th century. 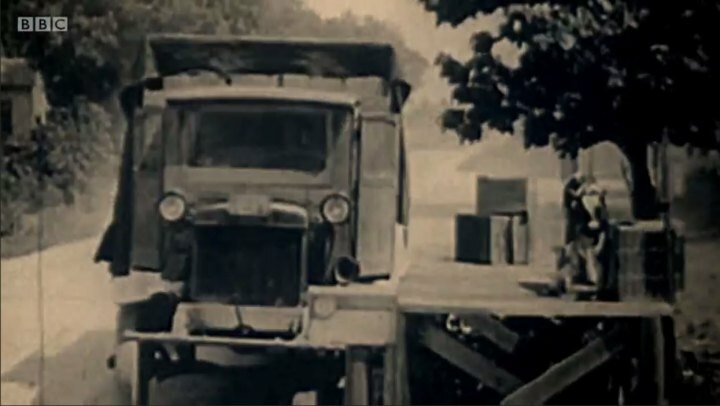 The Army did use Packard trucks in WWI.